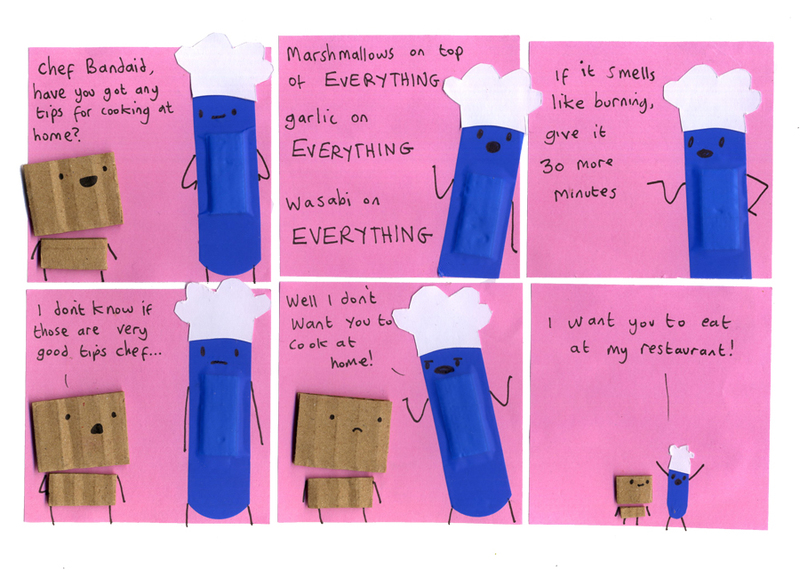 “Garlic on everything” is actually a pretty good tip I think. But not actually on EVERYTHING. Have you got any good cooking tips? I Like to put lemon juice on everything, but I don’t think that’s a cooking tip as such, I just really like lemons. Anything goes as long as you’re able to hold your nose while eating. Oh right, there are people who try that. Why did the characters get small in the last panel? Run out of cardboard? They didn’t get small, the world got big! My greatest culinary secret is putting V8 in my guacamole (a food which can also include both garlic and lemon juice). Try it yourself, then spread the word.